Posted on August 29, 2013	by Derek "Gamer Crash"
Well, this is some DLC that I didn’t see coming, especially when you consider that it’s for a game like BioShock which is strongly narrative and environment focused. I wouldn’t place “combat” or “gunplay” as the defining or even primary element to a title like BioShock so to design an entire DLC around it was a bit baffling. Still, I went into Clash in the Clouds with as open a mind as I could muster. Here’s some initial thoughts after dumping a few hours into it. As I mentioned, Clash in the Clouds focuses solely on combat, so don’t expect some interesting story element to help push this along. 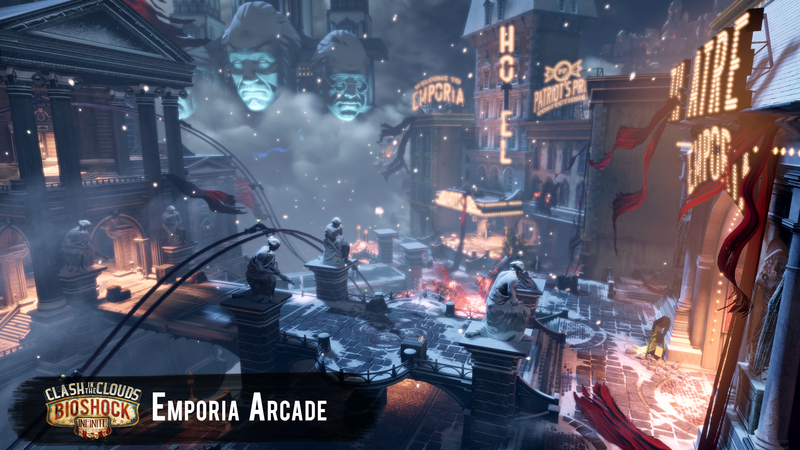 As Booker (and flanked once again by Elizabeth), you’re able to jump into four different combat arenas each based on a particular section within Columbia with a goal of making it through 15 waves of escalating difficulty. If you die, you can choose to continue but your running score will be reset. What’s interesting is you’re given access to all vigors early on in the game so those end game ones like Undertow and Return to Sender actually feel useful here. Replayability is helped along by “Blue Ribbon Challenges” which typically offer more cash as a reward for pulling off (sometimes) crazy challenges such as only using a pistol on a Handyman or having a possessed enemy kill two other enemies. There’s a ton of these things and some of them borderline on insane. If you’re into challenges, you’ll definitely appreciate these. In addition, this DLC is driven by scores and leaderboard standings which may also inspire some competition between friends. After each successful wave is beaten, you’re taken back to a safehouse where you can purchase upgrades for guns or vigors and change your loadout for the upcoming fight. Upgrading and advancing your gear happens much quicker than the main game as you’re gaining cash at a much faster rate and presented with either a new gear item or infusion after each successful wave. This little bit of downtime is much appreciated especially because of how different the battles can be from wave to wave. One minute you’re fighting simple foot soldiers and the next you have a couple of Motorized Patriots wandering around. The maps are on the small, arena style side of things, so battles tend to be short and chaotic. Elizabeth will provide help just as she did in the core game, so not much has changed there. One thing Irrational really highlighted prior to release was the new enemy behavior in the fact that they don’t trigger as soon as you enter an area. They wanted the player to be able to kind of scope out the situation first. For the most part, I see what they mean, but I don’t feel like it went far enough. Making any sort of movement or being spotted by an enemy will trigger them all just as you’d expect. There were even a couple of times where I was immediately spotted after just spawning into that wave, which was mildly disappointing. I wish there was a stealth option, as for the most part, enemies will swarm you once triggered. Probably my favorite element to this DLC is with the Columbia Archaeological Society, a museum style place which also servers as the player hub. In here, you can spend that hard-earned cash on unlockables and behind the scenes material including concept art, 3D character models, behind the scenes videos (presented as a Kinetoscope), and also unlockable music set to the 1900’s vibe of the game. It’s a pretty neat area especially for fans of the game. It won’t take too long to unlock everything which was kind of disappointing for me as I enjoyed being able to unlock these items. I guess you could say I wanted more things to purchase. Ultimately, this DLC isn’t something I’d specifically buy the game for. It’s a nice little diversion but is something that I grew tired of quickly. As I mentioned, I thought the Archeological Society area with all of the it’s behind the scenes elements and unlockables was fun and interesting, but . It’s only 5 bucks, which compared to other DLC, is on the cheap side so that certainly helps the appeal if you didn’t spring for the Season Pass. 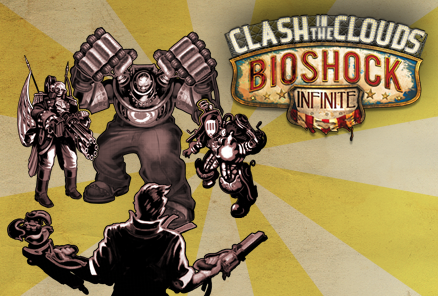 It’s a bit simplistic in its goals and also single-minded in its focus but if you’re looking for something to pass the time or want to pop something in for a quick gaming session, there are worse choices than the Clash in the Clouds DLC for BioShock Infinite. This entry was posted in Opinion and tagged Opinion, PC, PS3, Xbox. Bookmark the permalink.